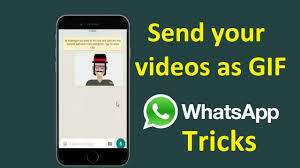 Whatsapp as you all known to be the best platform of chatting, it is considered to be the best because of it enomous features and it easy way of using it. One of the features that makes WhatsApp be the best is for it ability to send Emoji that expresses your mood when chatting. but now it seems GIFs is the new emoji. The GIFs support is one other latest features added to WhatsApp and a lot of people seems to prefer using this over the traditional Emojis we have always been used to. Whatsapp has finally added support for GIFs. The app is one of the more popular messaging apps available for Android and iOS, and it did not support GIF playback up until now. When you send and receive GIFs over a conversation thread in GIFs, you will see a ‘GIF’ badge on the image to highlight the image type. The GIFs don’t play automatically. You have to tap a GIF to play it. It is very similar to GIF support in the Facebook apps. Whatsapp has also introduced an in-app video to GIF converter and live photo to GIF converter. When you’re sending a video, you have the option to send it as a GIF. The option is available for videos that are 6 seconds or shorter in length. => Open a conversation or group in WhatsApp. => Click on the Attachment icon at the top right corner of the screen. => Open your gallery and select the video you want to convert. => A video editor will appear. Click on the camcorder icon at the top right of the screen and it will covert the video to a “GIF”. => Edit the video and tap o the green arrow when you are done to send. Note that the video you want to use must not be more than 6 seconds long. 0 Response to "How To Create, Send and convert Videos to GIFs In Whatsapp on your Smartphone"